70% of unemployed South Africans are aged between 15 and 35. Additionally, recent research reveals that 25% of unemployed South Africans have been job hunting, unsuccessfully, for at least 5 years. Not only do we clearly have a serious youth unemployment problem, we are also faced with the reality that a serious communication gap compromises the chances of young job and opportunities seekers. This communication gap contributes to continued unemployment, and to persistent skills gaps. Promote connectivity and conversation by offering free messaging on all makes of WAP enabled cell phones. 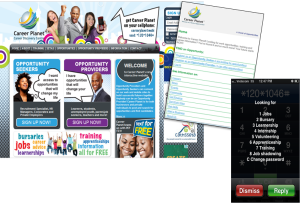 In August 2012, Career Planet’s full website, mobi site, and USSD platform were launched. Since the launch, 14 000 members have signed up, and over 1 000 opportunities have been loaded on to the site. I am 28 year old guy residing in a town called Mmamahabane Ventersburg. I am currently working as a ward committee member in my area and I am earning a stipend of R 500. I have bigger dreams, now I am working as a secretary within the committee and I am dealing with important matters and I feel I deserve money that can help me improve my life rather than only R500. But I am thankful. As they say, beggars cant be choosers. I need job assistance according to my mental capacity and money that will help me further my studies. Hi Jeet, interesting, I see it is based in India. What are your success indicators and how has it been going?